This article is about the stage from Super Mario World. For the other uses of the word Funky, see Funky. Funky is the eighth and final level in the Special Zone of Super Mario World. At the end of the level, there are coins that spell out "YOU ARE A SUPER PLAYER!!" (the "A" is omitted in the Japanese version). Funky is a long level, consisting of one long screen and only 200 seconds on the Timer to reach the Giant Gate. To make up for the low amount of time, the level has several green berries in it, the only level in which they appear (aside from the intro level). When eaten, these berries give Mario or Luigi 20 extra seconds to complete the level. This level contains nine green berries (three in the Japanese version), giving the player a maximum of 380 seconds (260 in the Japanese version) if all are eaten. 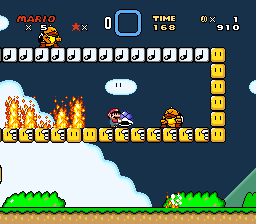 This level also contains five Dragon Coins and features a rare yellow Winged Koopa Troopa amid other colored Winged Koopa Troopas and Koopa Troopas. The entire level can be flown through if the player has a cape; however, it is tricky as the player will need to fly above the screen to clear a blue and yellow Warp Pipe. If the player has no cape, the player should start the level with a Yoshi to eat green berries to add seconds on the timer. Early in the level, Yoshi can be found in a high up ? Block. After the player gets past the Sumo Brother on the ? Blocks and under the Empty Blocks, a P Switch can be found in the first Rotating Block in the group of two. The P Switch will turn some ? Blocks to coins, which is helpful for the next area with two Sumo Brothers. After defeating two Chargin' Chucks and jumping off the Grab Blocks, the player will come to another Sumo Brother on some Jump Blocks. The level follows the same pattern from here until the end: Koopa Troopas mixed in between some gaps and Sumo Brothers Right before the final stretch, the player needs to get past three Confused Chucks. After beating this level, the player is given the option to save. The overworld will also change from spring to fall in the SNES version; in Super Mario World: Super Mario Advance 2, the season changes only once all 96 exits are found. This page was last edited on April 6, 2019, at 00:10.